Law of Leftovers (LoL) is a very useful technique for solving Jigsaw and Jigsaw Killer sudokus, the latter including all of the Texas Jigsaw Killers. Because all the rows, columns and the jigsaw nonets must each contain the numbers 1-9, it follows that the outies for any group of rows or columns must exactly equal the innies. Starting with a very simple example. 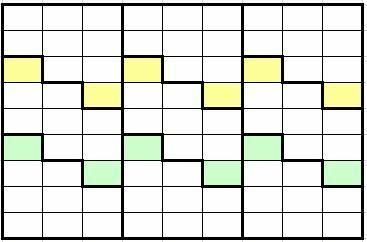 Each group of three rows or columns has one outie and one innies, shown by the colours yellow, green, blue and orange. 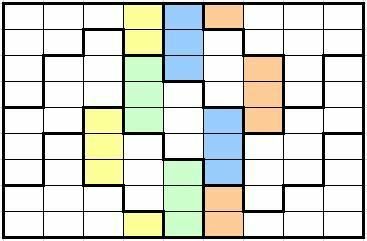 The number is each of the pairs of coloured cells must be the same. Thus R1C4 = R9C3, R1C7 = R9C6, R3C1 = R4C9 and R6C1 = R7C9. Next a jigsaw pattern which its creator named Stripes. 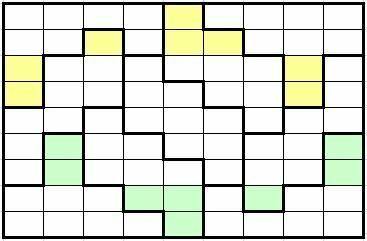 Here R123 has three outies in the yellow cells R4C369 which must contain the same three values as the three innies R3C147. 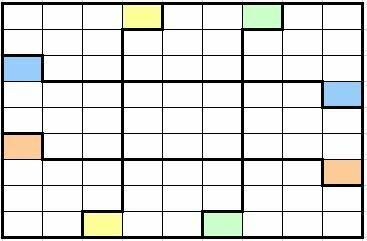 Similarly for R789 the three outies in the green cells R6C147 must contain the same three values as the three innies R7C369. And now for a more interesting jigsaw pattern which its creator named Zig Zag. This pattern is used in some of the Texas Jigsaw Killers. In this pattern LoL can be used for the columns and the rows. Starting with the columns, which are simpler and easier to spot. LoL for C123, three outies (yellow) R129C4 must contain the same values as three innies R567C3. LoL for C1234, three outies (green) R789C5 must exactly equal three innies R345C4. Similarly the blue cells for C6789 and the orange cells for C789. Now for LoL on the rows for this jigsaw pattern. LoL for R12 four outies (yellow) R34C18 must exactly equal four innies R1C5 + R2C356. Note that in this case both the outies and the innies are divided into two groups. Therefore it's possible that one number can be repeated in the outies and the innies because R1C5 and R2C3 don't 'see' each other. Similarly the green cells for R89. There are other LoLs, using larger numbers of cells, available in this jigsaw pattern but they are less likely to be useful. So far I've emphasised that the outies and innies must contain exactly the same numbers. The reverse is also a valuable use for LoL. If the outies don't contain a particular number, then it follows that the innies don't contain that number (and vice versa). LoL can be used for Jigsaws and Jigsaw Killers of any level of difficulty. My personal experience with the Texas Jigsaw Killers is that it isn't necessary to use LoL for SS scores up to 1.20, so I solved most of Ruud's earlier TJKs without using LoL. However please feel free to use LoL on easier puzzles; it may well give a quicker solution. For Texas Jigsaw Killers with higher SS scores it's definitely quicker and in many cases essential to use LoL. Good explanation, Andrew! Thank you! I'll have to spend some time studying it out.